Is London real estate still a buyer’s market? Is London still a buyer’s market? The answer that wants to instantly roll off the tongue is “yes, it’s the capital of the UK”. However, with the city currently reporting declining and stagnant house prices in most areas, that answer is becoming more uncertain as the years progress. Conran’s comments are reflected too by Will McKintosh, head of residential at JLL Middle East, Africa and India, who notes a shift in buyer demand. “Since JLL London Residential established a team in 2013, selling UK properties to buyers within the Middle East and North Africa, we have seen a change in demand and buying patterns,” says McKintosh. “Our clients range from nationals and GCC investors to all types of expatriates and we initially found that the demand was primarily for London, with a varied mix between own use and investment for rental yields. However, investors recognise that these other cities represent a strong commercial investment with commitment to regeneration and yields, typically 6-7 per cent versus London’s conservative 2-4 per cent gross. McKintosh cites cities such as Slough and Basingstoke that have also faced similar demand being within the commuter belt and benefitting from a commitment to new transport links, such as Crossrail, which has encouraged people working in London to travel and live in the upcoming new developments. And while the market appears to be waning somewhat when it comes to residential investors choosing London first, there are still some buyers who remain confident. McKintosh says another area that has seen significant change in terms of the retail and food and beverage mix is Covent Garden. “We are starting to see some buyers from the region see this as a new and exciting area with a great vibe in which to live,” he says. Conran believes that the UAE will remain a key market for London property in the long term. “There are still buyers in the UAE who continue to buy into London and I don’t think that will ever disappear,” he says. And this is the reason the commuter belt represents an opportunity in the affordable London borough. While Slough, Reading and Basingstoke still won’t be part of London, the completion of Crossrail will provide quick access to the capital. 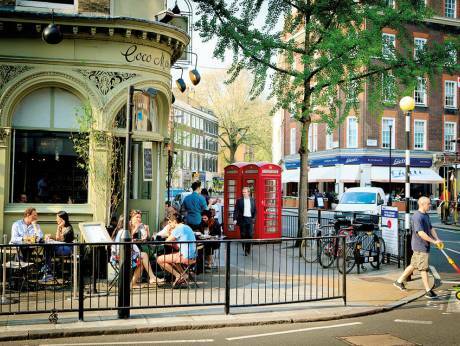 With these towns and larger regional cities pouring money into improving the infrastructure and lifestyle for residents, the savvy investor will recognise that the UK property market is a different beast to what it was a decade ago. London is still a hive of activity, but these other regions represent opportunity.